At the end of 2013 I bought some Holland Colours stock for €28 per share and sold in February 2015 at €45 for a 60% profit. A bit too early with 20/20 hindsight? Even now, Holland Colours seems like an acceptable investment for the Graham Defensive investor, although it is too small. SECTOR: [PASS] Holland Colours is in manufacturing. Technology and financial stocks were considered too risky to invest in when this methodology was published. SALES: [FAIL] The investor must select companies of "adequate size". This includes companies with annual sales greater than €260 million.Holland Colours' sales of €73 million, based on 2015 sales, fails this test. CURRENT RATIO: [PASS] The current ratio must be greater than or equal to 2. Companies that meet this criterion are typically financially secure and defensive. Holland Colours' current ratio €30m/€11m of 2,7 passes this test. LONG-TERM DEBT IN RELATION TO NET CURRENT ASSETS: [PASS] For industrial companies, long-term debt must not exceed net current assets (current assets minus current liabilities). Companies that do not meet this criterion lack the financial stability that this methodology likes to see. 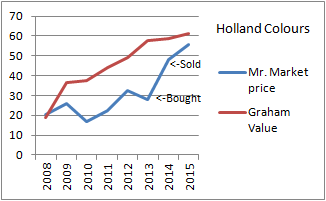 The long-term debt for Holland Colours is €1 million, while the net current assets are €19 million. Holland Colours passes this test easily. LONG-TERM EPS GROWTH: [PASS] Companies must increase their EPS by at least 30% over a ten-year period and EPS must not have been negative for any year within the last 5 years. Companies with this type of growth tend to be financially secure and have proven themselves over time. 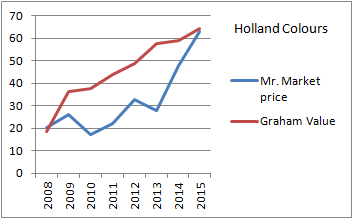 Holland Colours' earnings have increased during the past years, but I don't have the figures from 10 years ago. Earnings Yield: [PASS] The Earnings/Price (inverse P/E) %, based on the lesser of the current Earnings Yield or the Yield using average earnings over the last 3 fiscal years, must be "acceptable", which this methodology states is greater than 6,5%. Stocks with higher earnings yields are more defensive by nature. Holland Colours' E/P of 7% (using the average of the last 3 years Earnings) passes this test. Conclusion: Holland Colours has a strong balance sheet, is partly employee-owned and seems like a good pick for the Defensive Investor at a price of €55.9 in October 2016. Recall Warren Buffett's rules: Rule Number 1: Don't lose money. Rule Number 2: Don't forget rule Number 1. Holland Colours isn't going to make you rich overnight, but you probably won't lose all your money. See: www.beterinbeleggen.nl for more in depth, qualitative analysis of "good" companies.